Looking like it just stepped out of a DeLorean time machine, the limited edition ’51 Telecaster PJ Bass updates a classic design with thunderous modern tone and enhanced feel. The authentic style extends from the distinctive single ply black pickguard to the dual concentric volume knobs and vintage spaghetti logo on the headstock original era touches brought into the present. It’s punchy, growling, seismic and like nothing you’ve heard or seen before. Two Custom Shop pickups give this bass its rumbling power a ‘60s Jazz Bass single coil bridge pickup and ‘60s P Bass split coil middle pickup bring the thunder, shaped by chrome dome dual-concentric volume controls and a master tone control. 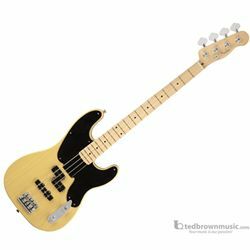 The 34” scale Telecaster bass maple neck has an American Vintage “ ’63 P Bass” shaped profile, along with a modern 9.5” radius fingerboard for enhanced playing feel, topped with narrow tall frets black dot position markers. The HiMass Vintage bridge uses vintage style nickel plated brass saddles for enhanced Fender tone. A powerful addition to any bassist’s stable, the ’51 Telecaster PJ Bass comes to you straight from the heart of rock ‘n’ roll. Includes a hardshell case and Certificate of Authenticity.